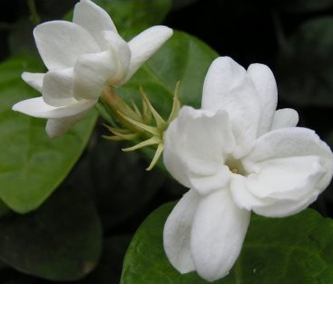 The Water Jasmine, wrightia religiosa, is the material most often used for bonsai in Malaysia. It is widely planted as a hedge tree in southeast Asia countries because the wrightia is twiggy and is used for medicinal purposes. The Water Jasmine loves the heat and prefers as much direct sun as possible. It can be semi-deciduous during winter if not kept above 65 degrees fahrenheit. The flowers are white, pendulous, and fill a room with a very lovely fragrance. Long, green bean-like seed pods follow flowering if insects pollinate the flowers. 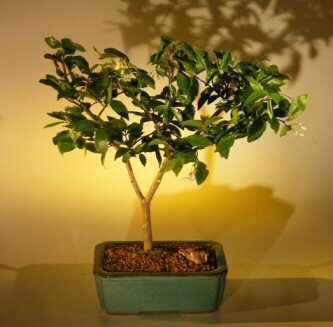 Recommended flowering indoor bonsai tree, grown and trained by Bonsai Boy.